Goals and measurements, a topic that once again blends in some management concepts (TAPUniversity is a learning portal that supports management and technology so it’s fitting). The brain thrives in goal setting situations. Often it’s the mental part of the game that keeps exercise programs on target, or causes them to slip. So put on your SWOT caps, step up the dry-erase board and chart your life! For the last several years I’ve seen them boldly rush in to the local YMCA we belong to in the first week of January. Brave and very well intentioned people making a change. Hit the gym, push the pedals, ramp up the treadmill and check out a class! Somewhere in early February it becomes apparent those that can make it stick and those that won’t. What was made as a resolution soon fades under the pressures of life or unrealistic expectations. Relationships develop– we are meant to do things together. Even if it’s a bunch of introverts who just meet at the same thing and do their stuff quietly. When done in pack we stick. We’re pack animals. Even Rocky had Mick, then Apollo, Duke and finally Paulie (ok 1 of those is not like the other). Some activities can be done alone, but doing stuff together makes it motivational. Doing something that you can enjoy once you’re over the learning curve. If you’ve never swam before it’s a stretch to think you can jump out of adult swim lessons and into lap swimming in 4-5 weeks. I know several triathletes have greatly improved their swimming over the course of a year and found enjoyment. There is a learning curve to each new exercise, technique so patience helps. It can be fun. Kicking myself from a recreational bike rider to one that has clip shoes, cares about carbon forks/frames and has the foggiest notion about rhythmic stroke motion has been a blast. It’s also been good for the brain – you see I’m learning something new and triggering that learning in the limbic or “doing” part of the brain. Goals and measurements – I should add “reasonable” goals and measurements. Unreasonable goals flow through two channels (one) if exercise is viewed as a one shot, 90 day miracle deal or (two) if the expectation is to shed 50lbs, increase strength, speed, stamina potentially in 90 days. Neither works. Reasonable goals with measurement should help propel you – not defeat you. Goal setting start with an accurate assessment of what your current level is. 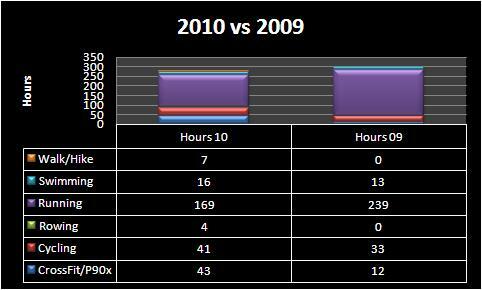 Here’s mine for 2009 I typed into a simple spreadsheet I keep on 12.28.08 and a measure of where I’m at as of August 6, 7 months into it. I try to just keep an honest flowing conversation going with myself – no bull. 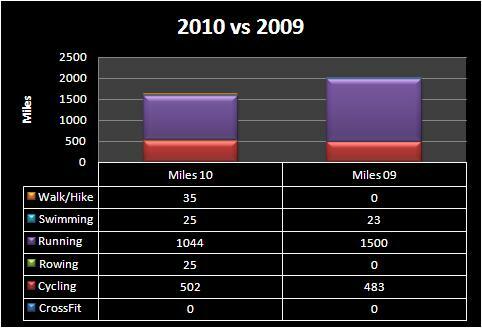 Running on target – 27.9 average, highest number of 40+ mileage weeks since 1997. High points – Cornhusker State Games & Thunder Run 5k’s, winter and Pikes Peak build up; Low Points – after my father passed away in April – a bit listless. Swimming below target but planned up tick in August following Pikes Peak – 17 miles. High points – most mileage since high school and tried new events (1k open water swim) and HyVee 1,500 meter swim at 38 minutes. Low points – CSG sprint tri was 4 minutes slower? Cycling – over or ahead by 65 miles – cranked in more for HyVee and hope to finish with 500 total (leads into 2010 goal of 1/2 iron man). High point – learning to ride a ‘real’ road bike for CSG in June and somehow not totally embarrassing myself on HyVee bike portion. Low point – taking too long to ask to borrow a decent road bike. Des Moines 4:10 updated to sub 4 hours, why that when I blew up in Lincoln? Figuring out the root cause (thyroid / hydration / base mile / April stress) and am getting in much better shape. I also have 4 to 5 “litmus test” races from 1/2 marathons to 10k/5k to validate. My longer term, 2 to 4 year horizon, goals include 1) Boston Qualifying marathon of 3:30, 2) 1/2 Iron Man and once #1 goal is met, Iron Man Triathlon, 3) 10k swim without search and rescue and 4) matching PR’s in running (5k, 5 mile, 10k, 10 mile and 1/2 marathon). Could I knock these goals off based on where I was at in December of 2008? No. But I can build each year. Could someone new to any of these activities blaze by me with 6 months of training – absolutely! And after tripping them I would applaud – goals and measurements are personal. The miracle is making it out the door. 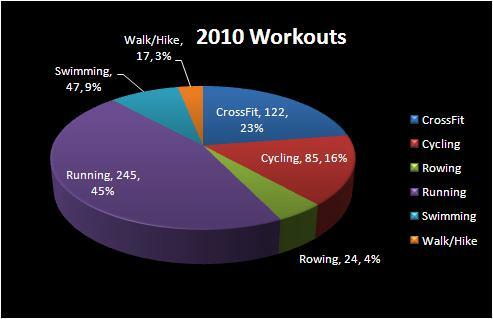 Please let me know some of your exercise goals and ways you use to measure. Another method I’ve found fun to measure is a through a couple of ad-in’s in Facebook: VOMaxer and RunLogger. It’s been encouraging to see how virtual and ‘real’ friends are doing and to chart my own progress. 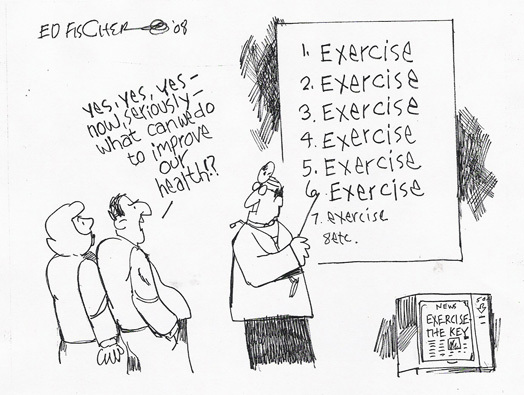 Finally wanted to share a cartoon the extols the benefits of beginning your program. So what do I need to do for good health?